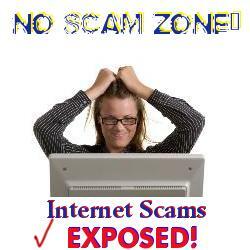 Unfortunately internet scams have been around from the beginning of the world wide web. The old saying "if it sounds too good to be true it probably is" is a good guildline when evaluating any online business or work from home opportunity. It's not always as easy as you think to determine if in fact any opportunity is an outright scam or simply over hype with a very small percentage of the members actually being successful. When it comes to money people of low character seem to come out of the woodwork. Let's expose them together! Our priority is to share our decades of collective online experience to help others learn from the mistakes and lessons we've gone through the hard way. No one likes being scammed, but at least we can benefit from it and help others at the same time. When posting a review of any online business opportunity please be a descriptive as possible as well as sharing any proofs, documents, images etc. to present your case. There is no member login required to post or comment at our Internet Scams Forum. Search our forums for scam alerts or post your own comments or questions regarding any online internet business or program you like. Rate and comment on any post in our forums pro or con. Your experience helps others keep from being scammed as well as answers to your questions will help countless others too. Do you have a internet program or business you want to include in our forums? Please start a topic here if you want to write your own scam alert/review or ask questions from others members about any online opportunity. Enter Your Forum Post Here! Click below to see contributions from others and feel free to comment or ask any questions you have. Not everyone has an overview and spacious as you, so wonderful, I can share your opinions on its website reviews outlook login.